I really liked the original Sonic Jump. It wasn’t a perfect game, but its mechanics were rock-solid and its gameplay was surprisingly addictive. I was surprised, then, when I found out that Sonic Jump Fever existed and would be released in a matter of days. I gleefully imagined everything it could be: a fresh, updated sequel to the original game with new mechanics, additional levels, and more characters. Maybe it would even include multiplayer support to better connect with your friends and challenge them to insane duels! I was excited. I shouldn’t have been. 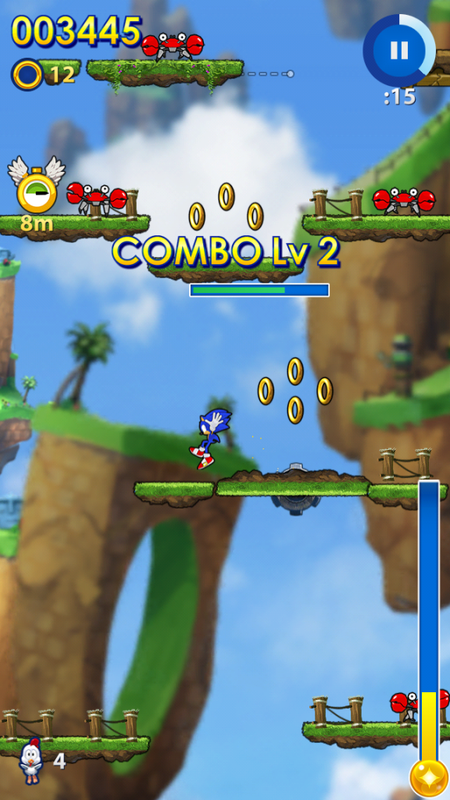 Sonic Jump Fever looks and feels a lot like its predecessor. As you get started, you’ll notice that the gameplay hasn’t actually changed all that much. Sonic Jump Fever is still a vertical platformer, and you play it exactly as you did the first time around: tilt the device left and right to move, and tap the screen to jump. However, instead of testing your mettle against an infinitely scrolling level, you’re now in a race against time to rack up as many points as you can in a minute or so. Every enemy or obstacle you destroy adds to your combo and helps fill a new meter at the bottom of the screen. Once it’s full, you’ll briefly launch into Fever Mode, where loads of rings are yours for the taking. You can augment your gameplay with unlockable characters, power-ups, and other various upgrades, but the overall experience is fairly close to what you played the first time around. Aside from the tighter controls, the core mechanics of the original game are intact and still work well. Most of the noticeable changes serve to make things more frantic, and the game does all it can to keep you moving at a breakneck pace through as much chaos as possible. Characters jump faster. The screen automatically scrolls if you move too slowly. Level gimmicks hurl you upward. Enemies, explosions, and particle effects fill the screen more often than ever. It’s so busy, in fact, that it can be tough to figure what’s going on, what you need to collide with, and where you even are on the screen. In keeping with the “frantic” motif, most of the graphics and music are busier versions of what you saw and heard in the first game. There are a handful of new zones and effects, but the overall presentation isn’t particularly groundbreaking. As it turns out, the biggest shortcomings are not in the gameplay itself, but in that which surrounds it. The series has adapted itself to the free-to-play model, and it’s here that Sonic Jump Fever stumbles mightily. Ads and microtransactions are everywhere, and this time, they’re even more intrusive than they were in Sonic Dash. Almost every screen in the game is littered with opportunities to spend some money. Some of them are subtle and reasonable, but others are downright egregious. For example, after you finish a game, you’ll see your standard results screen, but instead of returning to the main menu, you’re often taken into a full-screen ad. Sometimes it’s a simple picture or purchase suggestion, but other times it’s a game or movie trailer that you can’t skip until at least five seconds in. Buying something from the store removes these ads entirely, but for those of us who don’t want to spend any money, these incessant distractions are simply obnoxious. Moving to a free-to-play model has crippled many aspects of the game. To make matters worse, gameplay is tied to an energy meter that depletes each time you play a stage. 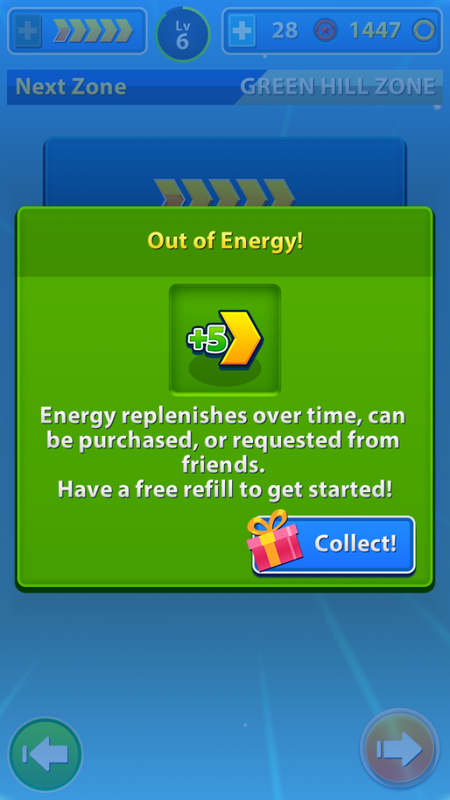 Once the meter empties, you can refill it by watching ads, spending red rings, spending actual money, or not playing the game. Your ability to play grinds to a halt after just five consecutive games, and with each game lasting about a minute apiece, I could only play for five minutes or so before needing to put the app aside so the meter could refill. This severely limits how much you can play, and it only serves to punish players who don’t want to jump through hoops for the privilege of actually playing. These restrictions also dictate how deep your gameplay experience will be. For example, you unlock additional characters like Knuckles and Amy by collecting tokens as you play. You can only find a handful of tokens per day, so if you’re a completionist, you’ll need to play the game for months to unlock them all unless you fork over some cash. Until then, you’re stuck with Sonic and Tails. This also extends to one of the game’s new features, a Chao Garden. Each Chao you find can impact your game in different ways, such as generating platforms to save you from a deadly fall. Unfortunately, you need to pay thousands of rings each time you want to find one, and since it’s so difficult to accumulate collectibles in large quantities, you’ll probably either pay for the privilege to hunt or ignore the feature entirely. In case you haven’t noticed by now, I’m not exactly a fan of most free-to-play games. Don’t get me wrong, I completely understand why the model works, but Sonic Jump Fever is proof of why this approach is bad for gamers. By making it unreasonably hard to unlock characters and features, the game pushes you to either spend money on these elements or risk missing out on the full experience. Precious few take the bait, so the vast majority of players are left with a crippled game that keeps reminding them of how amazing things could be if they would just open their wallets a little. In some ways, it’s more of a demo or a tease than a fully-featured game. Now I know you didn’t come here for a lecture about mobile gaming, so I’ll cut to the chase. Sonic Jump Fever isn’t the worst game you’ll ever play. It’s functionally sound, free of serious bugs, and plays well on some aging devices, so despite my biases, it’s not a total loss. If all you want is a free and simple game to play for a few minutes at a time, then you’ll likely find some degree of fun here. However, if you’re looking for a deeper, less restrictive, and less frustrating experience, go shell out three bucks and play the original instead. It’s simply a better game.